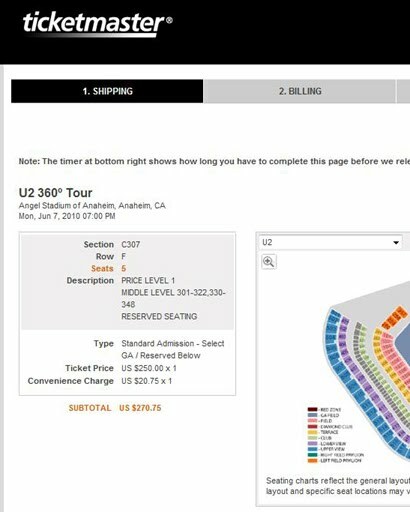 MY FAKE BRIT ACCENT: U2 jacked up their concert ticket prices? Yes, they did! Well, at least the tour presenters, Live Nation, did! 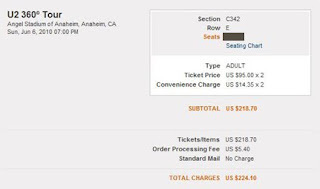 After sacrificing my tickets to two out-of-towner friends, for the landmark Rose Bowl concert last October, I made sure I get tickets for the second leg of their US tour. 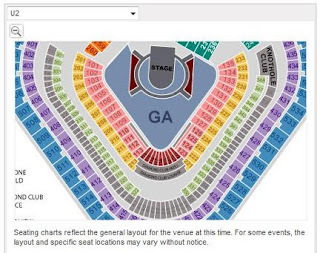 So when the June 6th 2010 Anaheim show at Angel Stadium went onsale last Nov. 9th, I went online and got myself "Club" (Middle Level) seat tickets. They were $95 a piece plus the usual Ticketmaster surcharges. That would be "Price Level 2" based on their pricing structure: Price Level 1 = $250; Price Level 2 = $95; Price Level 3 = $55; Price Level 4 = $30. Please note: my seats are at Club Level, Section 342 (to the right of the stage, 3 levels up). Anyway, the show was sold-out in just about 15 mins. Of course, the promoters were anticipating that they immediately announced a second night for June 7th at the same venue, to go on sale Nov. 20th. So this morning (Nov. 20), I went online again to get 2 tickets for my brother, Haro. He wanted "floor" tickets but the results were zero. So I tried searching randomly for any Price Level 1 tickets. I finally got 2 tickets: Club Level, Section 307 (to the left of the stage, 3 levels up). 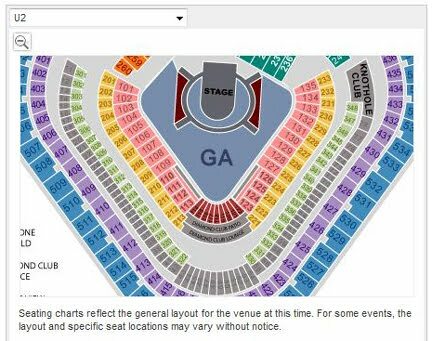 The same level as my June 6th tickets but on the opposite side. And guess what? They were $250 a piece! Yup, $155 more expensive! Sheeesh! Not just that, they also released single "production hold" tickets for the supposedly sold-out June 6th show. Just for the heck of it, I searched for a ticket on the Club level and there it was: Section 309 for the new price of $250! (that would've been $95 only if you bought tickets two weeks ago!, hehehe). The June 6th & 7th, 2010 shows are re-scheduled for June 17th & 18th, 2011 respectively.